Do you use your bike to get to a transit station? Would you be more likely to bike to the transit station you use if it was more easily accessible for bicyclists or had better bike parking? DVRPC wants your input! 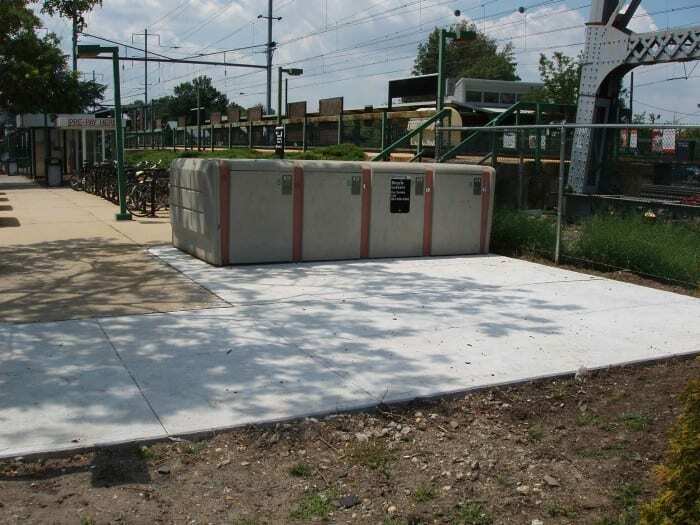 DVRPC, the Bicycle Coalition of Greater Philadelphia, SEPTA, NJ Transit, PATCO, and Open Plans are collaborating to determine where investments in bicycle accessibility are most needed. Available online, a new map-based survey allows commuters to select the transit station they use and share their ideas on how transit stations can better accommodate bicyclists. The survey, available at biketotransit.shareabouts.org, will continue accepting public input until December 1, 2012. The results of the survey will help to shape recommendations for investment in bike improvements at our region’s transit stations. For more information on DVRPC’s Office of Bicycle and Pedestrian Planning, click here. 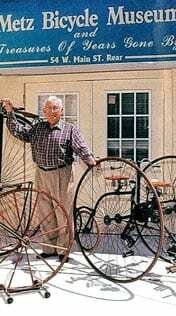 Summer brings out bicyclists as well as bicycle thieves. 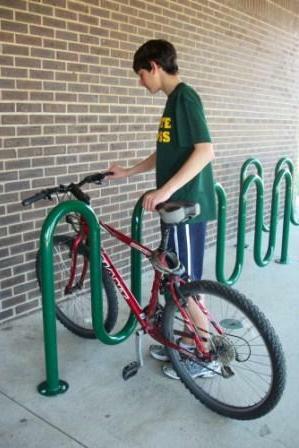 Remember to lock your bikes securely. 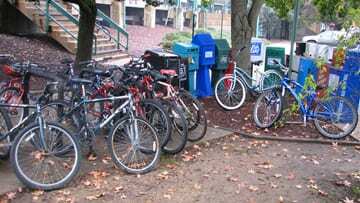 The New York Times reports an increase in bicycle thefts, but the article also notes ways to track bikes and thieves. 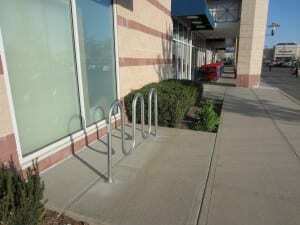 For more ways to keep your bicycle safe and tips on what makes for a good (or bad) technique when locking your bike, see our Bike Racks and Lockers page. 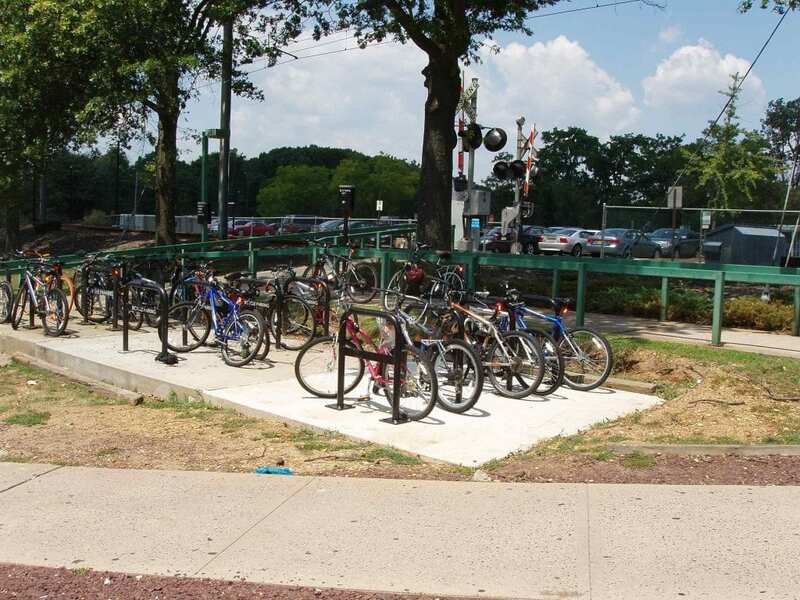 We are moving closer to adding more bicycle racks and lockers at the Princeton Junction train station. 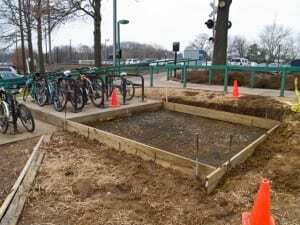 Employees of West Windsor Public Works took down bike lockers that were going unused at the Howell bus station and will install them in the coming weeks at the Princeton Junction train station, where there is a waiting list of people wanting to rent them. 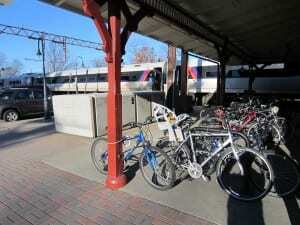 They also have bike racks from New Jersey Transit that will be installed on both sides of the Northeast Corridor tracks. 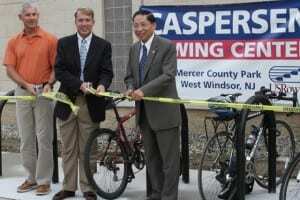 Join the WWBPA, WW Public Works, New Jersey Transit and the other partners on this project — Greater Mercer Transportation Management Association, BikeFest and the West Windsor Parking Authority — for a ceremonial ribbon-cutting at 8:30 a.m. on May 18. GMTMA is sponsoring a (grab and go) bikers’ breakfast beforehand. Mark National Bike to Work Week May 17-21 by riding your bike to the train station! The Delaware Valley Regional Planning Commission (DVRPC) is conducting a quick online survey of bicyclists and non-bicyclists in our region. Shifting Gears is an outreach program run by the Delaware Valley Regional Planning Commission (DVRPC) to help determine bicycle issues and priorities for our region. Shifting Gears seeks input from bicyclists and non-bicyclists through an online survey at www.dvrpc.org/shiftinggears. The online survey only takes about 5-10 minutes and asks questions about bicycle use, facilities, policy, and information on what would best enhance the cycling environment. Please go to www.dvrpc.org/shiftinggears and tell them what is on your mind. If you’ve already taken the survey, then tell your friends– don’t keep it to yourself. 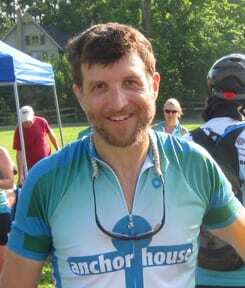 Bicyclists of any level, as well as non-bicyclists are invited to participate. 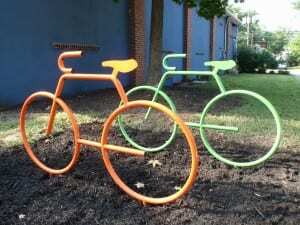 Kudos to BikeFest, which paid for badly needed bike racks at West Windsor-Plainsboro High School South, and West Windsor Division of Recreation and Parks for handling the installation earlier this month. Funding came from proceeds from the 2009 BikeFest (and registration is open for BikeFest 2010 on May 29). 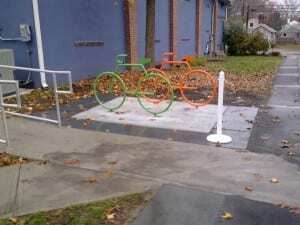 The two new racks, in Pirate green and located to protect bikes from the elements, can hold up to 22 bikes at a time. Read more about the racks in the WW-P News. Here are some of the articles and videos we’ve enjoyed over the past month. Who’d have thought that Columbia, Missouri, is becoming one of America’s bike-friendly communities? But this university town of 100,000 is one of four communities that is benefiting from a federal government pilot program that is creating “bike boulevards” and making it easier for residents to walk to local destinations. Its mayor says: “If we could get people to use their bikes or walk on 20% of their short trips, I’d be delighted.” Read more. But let’s be realistic: Change can take years. On the other hand, it has a way of feeding on itself. Watch this video about Boulder, one of America’s most bike-friendly cities, and how it got to be that way. 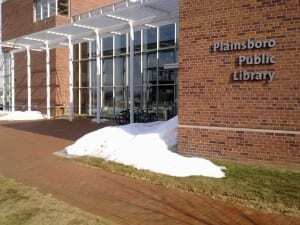 For those who want to do more reading on creating bike-friendly communities, the West Windsor library has a copy of Jeff Mapes’ Pedaling Revolution. 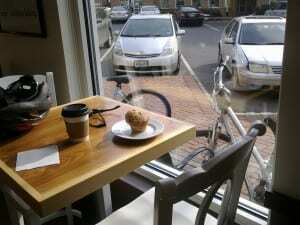 Read rock icon and cyclist David Byrne’s review. Several members pointed out the NPR interview with David Byrne, who has a book of his own out. In Bicycle Diaries, he shares the thoughts, adventures and observations he’s experienced while cycling through some of the world’s major cities. Finally, read about a heavy-duty bike ride from Queens to Princeton. Send us your reading, listening and viewing suggestions! About a dozen bicycles were stolen from the Princeton Junction train station this summer. That’s a small fraction of the 100 or so bikes locked there every day, but still very frustrating for the victims. Use a good lock. Or two. 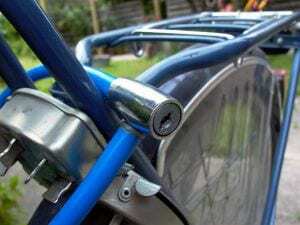 Even the most expensive lock can’t guarantee that your bike won’t be stolen, but thieves prefer easier targets and are less likely to have two types of tools to tackle two types of locks. Cable locks are easier to cut. Combination locks are easy to open. 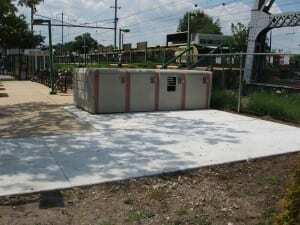 Finally, the WWBPA is working with New Jersey Transit and others to add 10 lockers at the station as well as extra bike racks. Let us know your ideas of how to make the train station and other areas around town safer.